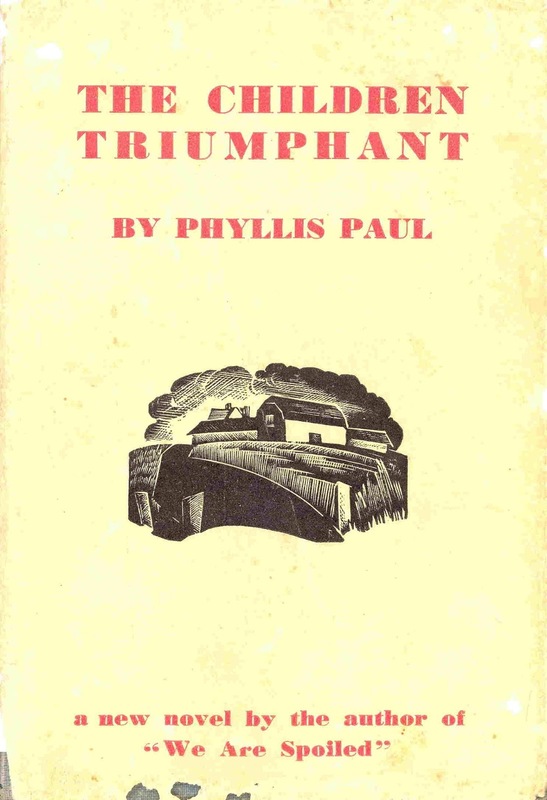 Phyllis Paul (1903-1973) published eleven novels, two in 1933-34, and nine others between 1949 and 1967. 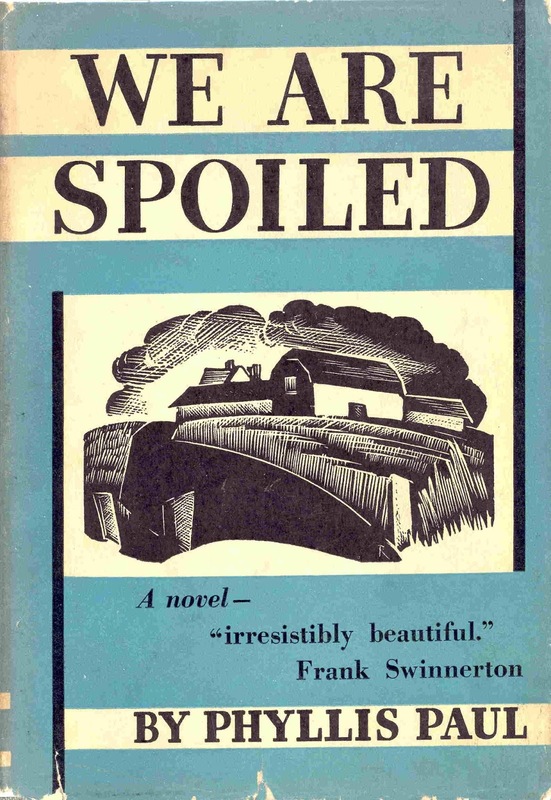 Her first novel was We Are Spoiled, published by Martin Secker of London in July 1933. It was followed ten months later in May 1934 by The Children Triumphant. Paul later felt her first two novels were of a different type than those she wrote afterwards, but they have many core similarities. We Are Spoiled is the story of the childhood and adulthood of several children brought up in Hammersing in slightly-rural England. The children include Christian Lauria, his two cousins Nancy and Louise Cloud, and neighbours Barbara Morrison and, most importantly, Jael Lingard. Jael is the central figure—an imaginative girl whose life is under the control of a Mr. Llewellyn (how he became guardian to Jael is never made clear), a distant and depraved figure who takes Jael to his life in Paris, where treats her quite openly as a cynical experiment. Though Llewellyn is a thorough rake, he is beyond sexual interest in Jael, yet he makes her take a vow of chastity. Another figure involved in the drama is Llewellyn’s son Hallam. Some years pass and Jael returns to Hammersing, now under the leash of Hallam. Old friendships, loyalties and rivalries are reignited, and the effects of growing up are shown to have taken a heavy toll on most of the children, leading in the end to madness in one case, and death in another. The underlying theme of the book is probably best expressed by Jael, who thinks: “was there any reason why life should not become quite unbearable? Considering that by the progress of its mental development humanity was enlarging its capacity for suffering, then why should not life become quite unbearable, not merely to the individual, but to the race? Why should not humanity at length utterly reject the curse of life and die away, another scrapped experiment in ‘evolution’? . . . But the mind of humanity showed signs of sickness. It was not the mind of a child at all, but a clever, self-conscious mind, tormented, and growing sicker every day” (pp. 238-239). This odd but fresh style continues throughout the rest of the book. While there is nothing of the fantastic about the story, the manner of its telling and its moods are fairly gripping and enchant the reader. As the Times Literary Supplement noted, while “many effective chords are struck, it is not easy to discern a dominating harmony. There is music here, angelic or devilish, but hardly earthly” (6 July 1933). 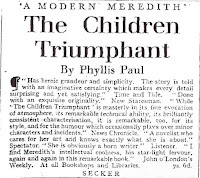 The Children Triumphant begins in December 1917 in the fictional hamlet of Rushmile in Kent. It tells the story of two girls, Edith Coventry and “Jemmy” [Jemima] Lacey. Edith’s father had been well-paid doing aircraft industry work for a period during the war, and the money allowed Edith to get some education. Her friend Jemmy was not so fortunate, and both seem unlikely to marry owing to the shortage of men after the War. Edith is soon further burdened by the death of her step-mother, after which she must raise three younger step-siblings by herself, as well as care for her father. Edith never warms to the children, and believes “they were born to be stoned” (p. 57). Jemmy is a curious character who seems to love Edith in a more than merely friendly way (though lesbianism is never stated), professing that she is uninterested in marrying and hopes to move away sometime with Edith. Edith, on the other hand, grows into a cold and incommunicative woman. She ends up surprising Jemma by marrying above her station. Her husband, Arnold Race, is the older brother of Harriet with whom Edith had become slightly acquainted when attending school as a girl. 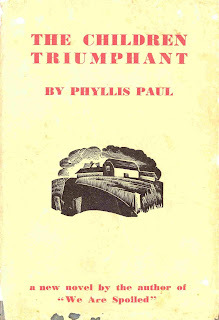 Jemma feels abandoned, but Edith is described (in phrases typical of Phyllis Paul) as looking “like a person in love with her own damnation” (p. 218), and it is noted that “the blaze of feeling she had had for him [her husband] at first had burnt itself out in a few weeks” (p. 221). 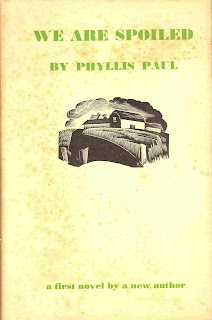 Eventually Arnold comes to understand Edith’s “startling disregard of other people’s feelings” (p. 252), and when, against Edith’s will yet with her consent, he brings home to raise the young orphaned son of his dead friend, the results turn tragic, as Edith feels trapped again in an impossible situation as she had been before. Comparing The Children Triumphant to its impressive and self-assured predecessor, it seems a slight step downward in quality. The structure is halting and uncertain, particularly in the first half of the book, while in the second half both the writing and the narrative flow are much more carefully worked out. One wonders, then, if The Children Triumphant, might actually have been the first novel Paul wrote, even though it was published second, for some of its flaws seem typical of an author finding their way in the process of composing a novel. Whether this is true we will likely never know. Still, the book was well-received on publication, with the Times Literary Supplement noting that “Miss Paul writes with an icicle, in a fine and distinguished way that is quite her own, concerned with a misfit in life . . . the effect is sombre, impressive, moving” (31 May 1934); and Graham Greene in the Spectator noted that Paul has “a serious claim to be judged as an artist” (14 June 1934). It would be fifteen years before Paul published her next novel. NB: This text reworks a “Late Review” of We Are Spoiled that originally appeared in Wormwood no. 22 (May 2014). 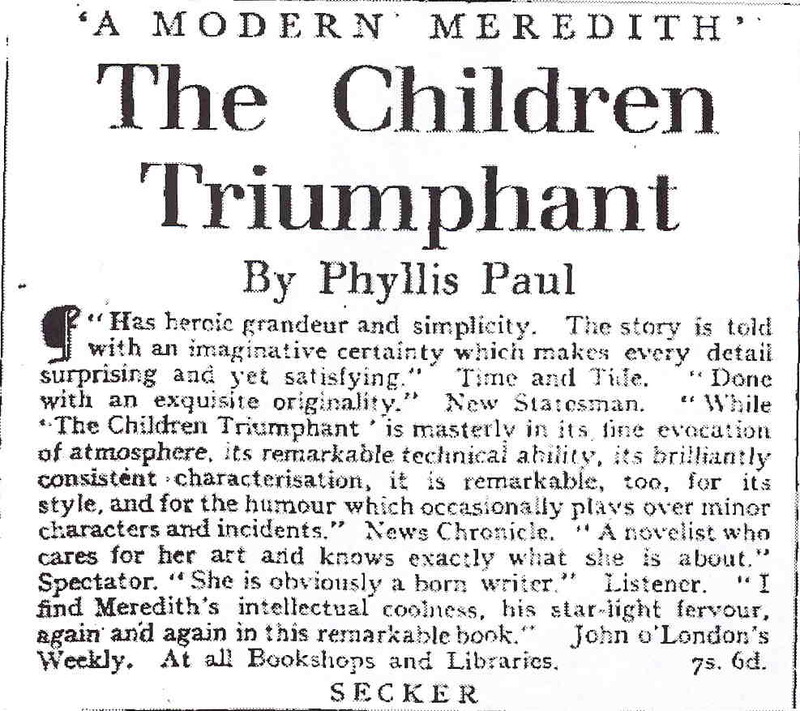 The review of The Children Triumphant has not been previously published. We Are Spoiled sounds very appealing, but--as so often--the book seems virtually unprocurable online. Where did you ever locate your copies, Doug? I'm always impressed that you turn up handsome editions of the books you write about so well. The sad truth, Michael, is that I started picking up Pauls in the late 1990s, after Glen Cavaliero wrote of Paul in his excellent volume The Supernatural and English Fiction (OUP, 1995). Back then occasional copies did show up. They've only become rarer since, as her work has had some attention.